The work in Sierra Leone is moving forward by the grace of God. Superintendent Christopher Conteh and the church in Sierra Leone continue to overcome various challenges for the advancement of God’s Kingdom. They have a dream of continually moving forward. 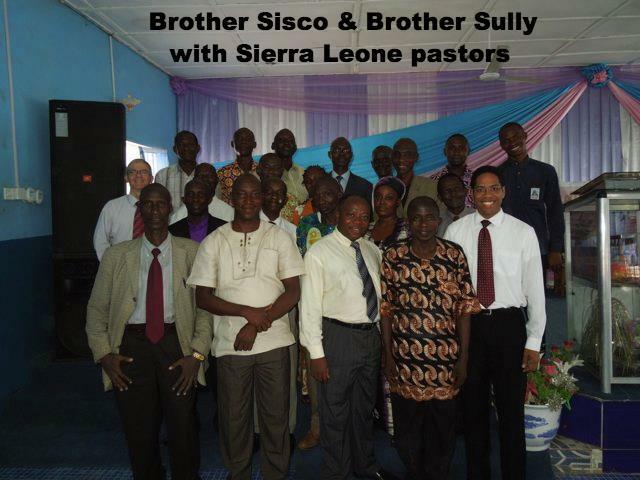 From April 16-21, 2013 I travelled to Sierra Leone with Missionary Sully to help them with their “Forward” dream. Twenty-four leaders attended the Pastors Refresher Course entitled, “FORWARD.” The three day Refresher Course dealt with a particular theme each day namely, leadership, doctrine, and growth. We are blessed in Ghana to continue the work started many years ago and to build upon the foundation of great missionaries and national leaders. Today we work in partnership with UPCI Ghana to see God’s kingdom expanded. 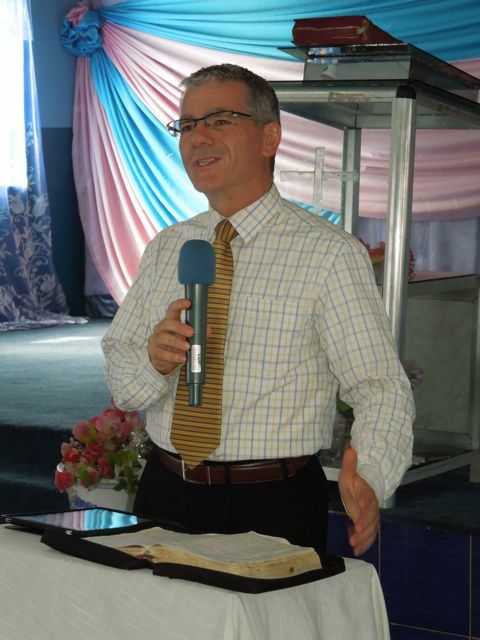 ACTS-Ghana is the main training arm of our church and we are expanding our reach through extension Bible schools. As a result of our Extension Bible school in Kumasi and a radio ministry, twenty-five people were baptized in Jesus name and two of them received the Holy Ghost while identifying with Christ in water baptism. A new preaching point has also been started. Our dream is to see the central Bible school increase its enrollment so more laborers can be prepared to harvest. An important need is to add a floor to our Bible school dormitory so we can accommodate more students. We have a dream of seeing this accomplished by the end of this year. We invite you to become part of this incredible dream to train and transform lives together. 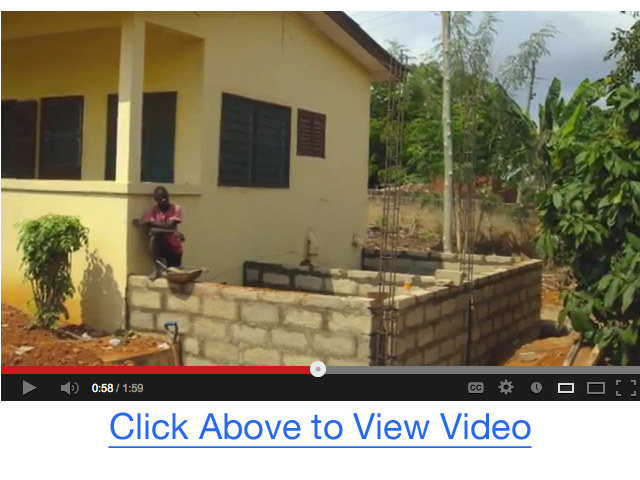 View the video above for more information. 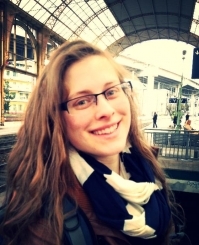 At 21 years of age, my friend M., from Glasgow, found herself hungry for something more. Her life felt empty, and in her search for truth, she found God in her bedroom, as she experienced the power of repentance, and the cross via a youtube video. She had a friend in United States who began witnessing to her on Facebook about Jesus’ name baptism and the infilling of the Holy Spirit; this friend connected her with another friend living in London, who connected her with New Life Church. M. had never been in a Pentecostal service before, but she immediately responded to the power she felt. Within a few weeks, she was beautifully and powerfully filled with the Holy Ghost and made the decision to be baptised in the precious name of Jesus. Watching her grow in her new found walk with Christ has been an absolute joy, along with the many others in New Life Church who have made the decision over the last few months to follow Jesus, no turning back. And it reminded me once more of the everyday decision of our lives to live for Him, to live for souls in the UK, no turning back. A decision that is too important to be anything less than life consuming. We must follow Him, we must reach for the souls of our generation, pulling them out of the fires of hell in England, Ireland, Wales and Scotland, in the USA, everywhere we go, and we cannot afford to look back. The costs of eternity are too great, the souls too precious to be taken lightly. While in Monaco for the WNOP Europe Middle East and Harvest Bible College Prayer trip earlier this month, I again was drawn to the treasure of souls, while speaking with young people from France, Monaco, London and one incredible kid we'll call Fred. In the moonlight beauty of Monaco, the young people spoke of their dreams, their hopes, their futures, and we told them why we were there, sharing our dream of a Jesus Generation. As we were talking Fred turned to me, “Hablas Español?” and it turned out he had family from Honduras, where I went on my very first missions trip over 10 years ago. My heart caught in my throat as he began to tell me of his family in Spain, UK, and right near my hometown in Florida, but my attention was captivated more as I sensed his hunger for God. “You are here with a church? What church is it? We only have two in Monaco, Catholic and Protestant.” It turned out he went to school with some of the young people from the church we were with, and already knew there was something different about them. In his 16 year old curiosity, he turned to the four of us standing there, “Do you sing? I think you must sing. I can hear it in your voice, please sing for me!” So we sang for him, and his eyes began to shine with tears as he clutched his heart, “I can feel something when you sing, its like fire, it makes my heart pound! and my hairs stand up, I have never felt this power before! It’s amazing! What is this power? !” and my heart breaks with the burden of Christ even more as I write this letter knowing that in my generation there are so many more who have never experienced the life giving power of Jesus. We have been positioned in these last days to influence the lives of those around us, but so many times we are distracted by the cares of life from our true calling to reach the lost. God help us, God help me to impact my generation like never before for Him. No turning back. To touch the M's, the Fred's, the Rita's, the Maria's of UK and Europe with the light of God. Allison Mitchell has served in Scotland since 2007, coming under full AIM appointment in 2008, under Missionaries Robert and Jerolyn Kelley. She is a licensed minister with both the UPCI and UPC Great Britain and Ireland and has ministered in several countries in Europe, preaching regularly throughout the United Kingdom, and speaking to youth, ladies groups and young ministers, as well as teaching in Harvest Bible College and serving as part of the Ministry Team for New Life Church in Glasgow. Her passion is to bring the fires together in the United Kingdom and Europe to unleash unquenchable revival in this end-time generation. I've got Georgia on my mind! We have completed our Revival by Design modules for our leadership and released five teams into the Harvest. We look forward to seeing what God will do through these teams. We held our first ever Resurrection Sunday drama, with 200 in attendance. God moved in a great way, and there was a move of repentance in the place. We have finished the flooring for our new Sunday/Bible School area. Thank you to Living Hope DC, Living Hope MD, Bro. Doran and Youth Group, and Brother and Sister Fowler. for making this possible. We still need to install electricity, drywall, and doors to complete this area. Any help would be greatly appreciated. Thank God for his provision. Shiloh had her tooth removed with no complications, and it only took 20 min. Kim also did not need to have surgery. Thank God for his power. This month we are asking for your prayer over the nation of Georgia. We are doing major outreach right now in our church. Pray that God would give the increase. A TRIP ORDAINED AND BLESSED BY LORD!! 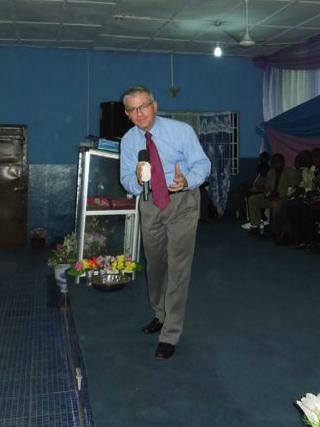 On Wednesday, April 17 I arrived in Freetown, Sierra Leone with Missionary Nick Sisco. We were there for two events: a Pastor's Refresher's Course and Revival Services! These two events woven together made for a great week of ministry. God blessed, strengthened and encouraged all of the pastors in attendance from across Sierra Leone. Without a resident missionary, these visits are vital to the work and anticipated by both the saints and the ministry. During our Pastor's Refresher Course, we moved through these themes: Forward in Leadership, Forward in Doctrine, Forward in Church Growth. Covering a variety of subjects within these themes, these three days of seminars were both busy and blessed! There is great growth that comes as a result of teaching! On Thursday and Friday evening and Sunday morning, saints from a number of area churches gathered for revival services. 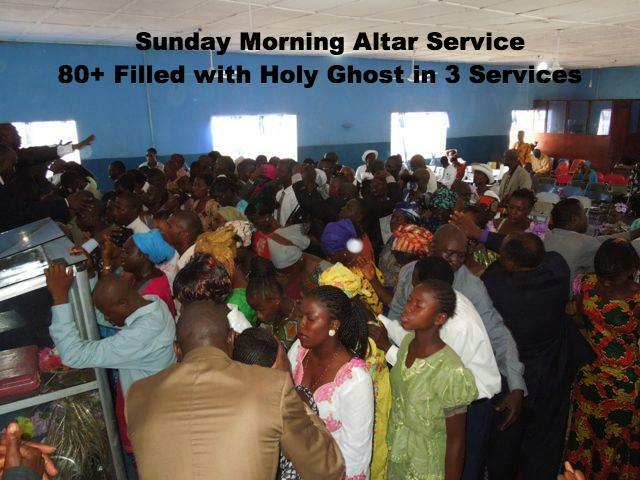 A mighty presence of God moved into each altar service and God blessed in a mighty way. Along with many healings and deliverances, over 80 souls were filled with the Holy Ghost. 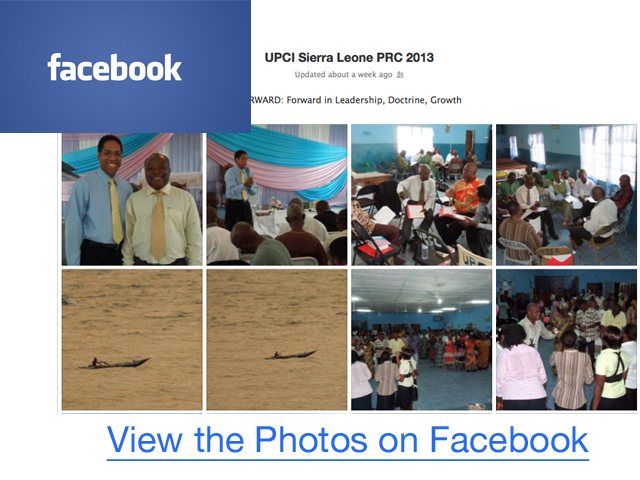 For a glimpse of our ministry in Sierra Leone, click here to view a photo album!! Once again I want to thank Voice of Pentecost Church - MacAdam and Edmunston UPC both in New Brunswick, who gave to make this trip possible!! This investment has impacted many souls beyond the pastors present and lives changed in the services. We believe this will be a catalyst for an unprecedented revival in Sierra Leone!! We truly are grateful for the sacrificial giving, not only of these churches, but to all who pray and give regularly in support of Mission Senegal!! First Bible School Graduation In Many Years!!! During our National Conference we held our first Bible School graduation in many years! We were so thrilled to see our 20 students stand to receive their Certificates. For many church members this was their first time to ever see a graduation. Really this is the only way to get the Gospel into PNG!! We are looking forward to many of these students going out and spreading God’s Word amongst the PNG people!! Many will start daughter works and go pioneer where there aren’t any churches established. Please continue to pray for the Bible School and it’s leaders. There were cheers of triumph mingled with tears of happiness as the heavy equipment rolled in to begin the groundwork for our Bible School Construction! The Bible School students were absolutely amazed and overjoyed to see the work finally beginning! Now that the machines have done their work, it's time for our work to begin! During the Easter weekend the PNG church held it’s Annual General Conference. We are very happy to report that during the conference there were 239 people Baptized in Jesus' Name and 170 filled with the Holy Ghost. Praise God!! There was such a powerful presence of the Lord throughout the conference. Many people reported miraculous healings. Nothing stopped the people coming to the services, even when it rained and the ground became muddy. They would run to the altar after every service and sometimes without waiting for the preaching to finish. We would like to thank Bro Monte and Sis Dianne Showalter for coming and Ministering to the Church of PNG. Safety– Crime is on the rise!! We appreciate everyone of you for supporting us, none of this would be possible without YOU!! !